With the addition of the King of the Hill trail now open to the public, Shanty Creek Resorts hosts more than 38km of Nordic trails weaving through the woods and meadows of Shanty Creek's nearly 5,000 acres. And there's even more to see and experience when you visit Bellaire including Glacial Hills Pathways and Grass River Natural Area. From gentle trails through pine forests of Schuss Village to more technical terrain between the three villages of SCR, Nordic skiers will find what they are looking for--including multiple options for an après-ski at Ivan's, the River Bistro, the Lakeview, or in downtown Bellaire at Short's Brewpub. An up-and-down circumference of Schuss Mountain trail known as King of the Hill featuring 100% snow making. 5km of dedicated multi-purpose trail at Cedar River for snowshoeing, fat tire biking, and dog walking/pet friendly usage. Never been but wanting to know first-hand why cross-country skiing is so magical? Start off on the right foot with SCRs expert Nordic instruction staff, and love this beautiful sport from day one. We have skis, boots & poles for everyone! Call the Nordic Center at 231.533-3000, ex. 4300 for additional details and instruction offerings. You can snowshoe anywhere on ShantyCreek's 5,000 acre property, EXCEPT groomed and trackset cross country ski trails. Snowshoers are asked to stay off the groomed ski tracks. For those that would prefer a defined trail, at Cedar River there is a 5km groomed multi-purpose trail specially designed for snowshoers (and fat bikers). 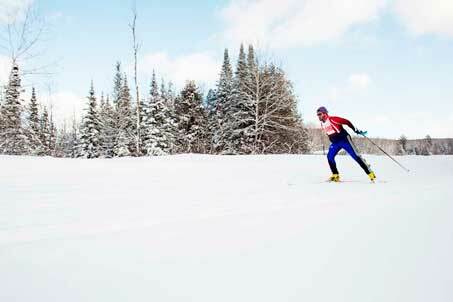 For information including snowshoe rentals, call our Nordic Center at 231-533-3000, ext. 4300. Not ready to put your bike away when the snow falls? If you haven’t tried pedaling northern Michgan’s winter trails on a fat tire bike, you can take a test ride at SCR! Winter fat tire bike rentals are available from Bellaire's Paddles and Pedals. The team from P+P is available during Saturdays and Holidays on the lower level of The Lodge at Cedar River, and daily in downtown Bellaire. Rent one, or bring your own, and ride the multi-purpose 5km trail. For more fat biking opportunities, head to Glacial Hills in Bellaire. Pine Cone was rolled yesterday and we will run the Tidd Tech today. King of the hill trail is excellent everyday. The rest of the system is natural snow. Spring conditions. Call 231-533-3000 x 4300 for current open trails and conditions.